This statistic depicts the results of the National Health and Nutrition Examination Survey (NHANES), which is conducted by the Centers for Disease Control and Prevention (CDC). 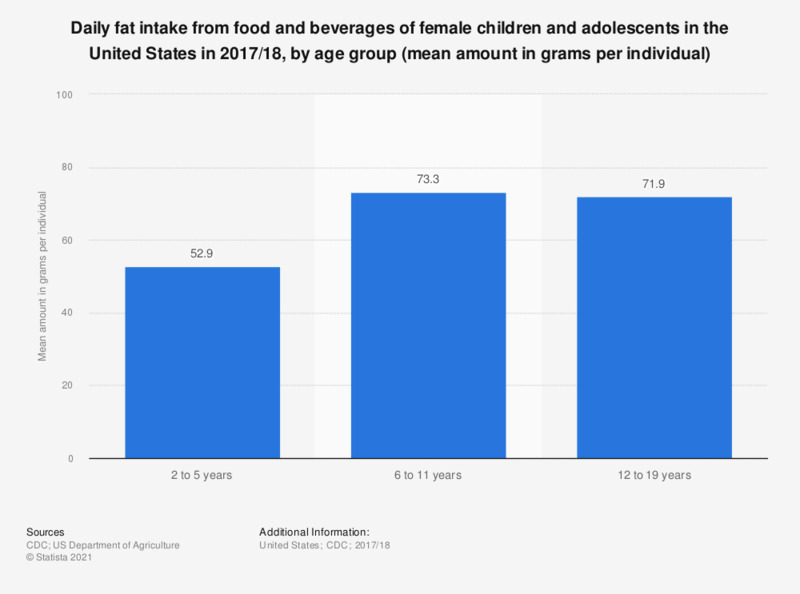 The statistic shows the daily fat intake from food and beverages of female children and adolescents in the United States in 2015/16, broken down by age group. In that year, 6 to 11 year old U.S. female children and adolescents had a daily mean fat intake from foods and drinks amounting to 72.3 grams per person. Sample weights designed for dietary analysis were used to allow estimates representative of the U. S. population for the years of collection. The statistics in this table are estimated from Day 1 dietary recall interviews conducted in the What We Eat in America, National Health and Nutrition Examination Survey (NHANES) 2015-2016. The 24-hour dietary recalls were conducted in-person, by trained interviewers, using the USDA 5-step Automated Multiple-Pass Method. Food intakes were coded and nutrient values were determined using the USDA Food and Nutrient Database for Dietary Studies 2015-2016 www.ars.usda.gov/nea/bhnrc/fsrg. Intakes of nutrients and other dietary components are based on the consumption of food and beverages, including water, and do not include intake from supplements or medications. The table includes data from individuals 2 years and over. Breast-fed children were excluded because breast milk was not quantified in dietary recall interviews. Everything On "Child health and nutrition" in One Document: Edited and Divided into Handy Chapters. Including Detailed References. Statistics on "Child health and nutrition"
Do you plan to eat more or less of these food products? On average, how many portions of dairy products do you eat everyday? Are you considering to decrease your intake of the named products/ingredients? How many times during the past 12 months have you eaten...? Do you buy ready meals for Christmas dinner?